Everyone who has ever been to Whangarei for more than a day or two knows that the place to be on Saturday morning is the amazing Whangarei Famers market where you can buy great fresh produce and other treats grown and farmed in Northland. It’s the perfect place for a smart meter education campaign to reach lots of people. 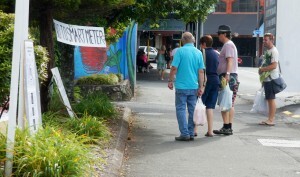 The eye-catching signs (some of which had previously been on display in Betty Hooper’s garden) allowed people to engage with the message in their own time and became a focus of interest and discussion. The photos of the smart meter education campaign at Whangarei Farmers’ Market were taken on February 27, 2016. 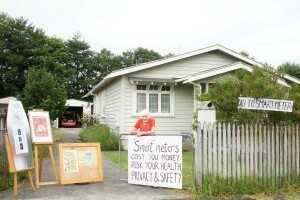 Ninety-six year old retired special education teacher Betty Hooper recently took advantage of living on a main street of her Northland town to help educate her community about the smart meter issue. Betty has been interested in both health and education all her life. Her work with special needs children stimulated an interest in how good nutrition (or lack of it) affects children’s health and ability to learn. 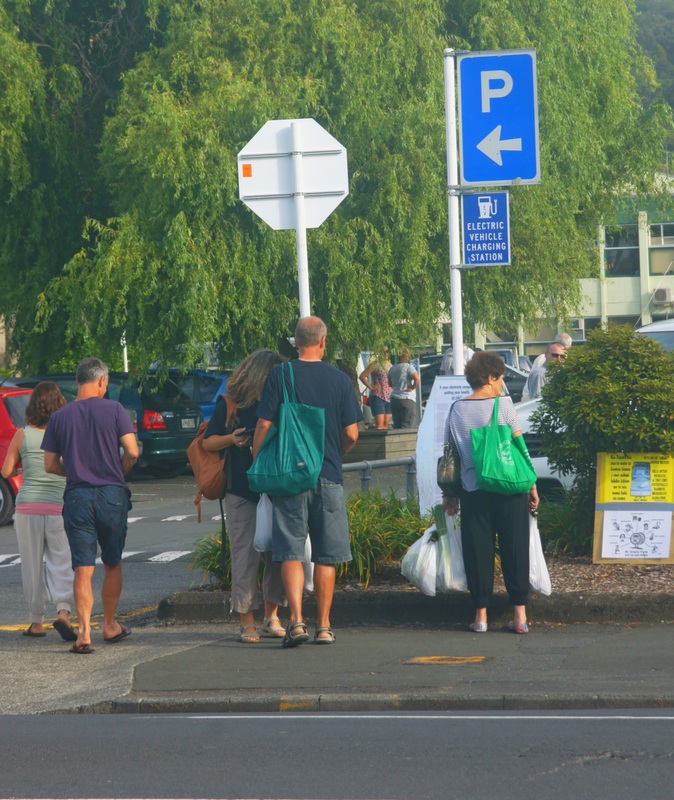 She is a member of the Patients Rights Advocates Waikato Incorporated which provides support to people who have chronic health problems, and helps them navigate the maze of the modern medical and social welfare systems. A talented artist and craftswoman, Betty recently combined her interests in spinning and creating home-made dyes with her quest to educate parents about the value of good nutrition and the importance of avoiding artificial additives. 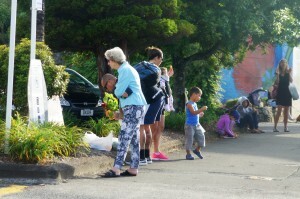 She dyed homespun wool with “Raro” (imitation fruit drink) crystals – and displayed the results at a stall at a health expo as a conversation starter. 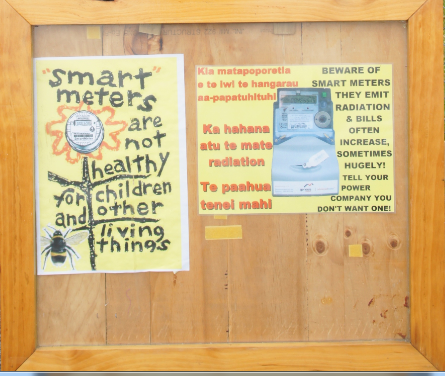 Betty’s smart meter education display in her garden was a temporary initiative but she is still working on the smart meter campaign by giving out leaflets in her neighourhood. NB: Please click on the images below, to enlarge them. NB: If you would like to download one of the Te-Reo English posters as used above, you will find this poster on our Resources Page or you can read about it here.